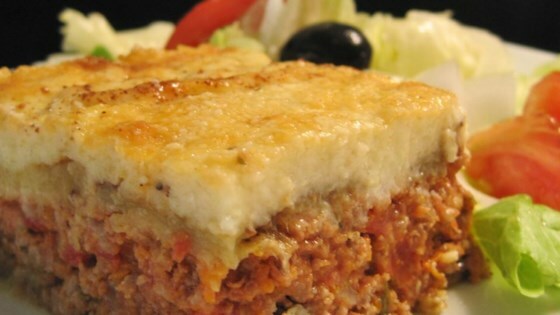 "Here is a great recipe for moussaka, a Greek dish. It includes sliced eggplant baked in a ground beef sauce and then smothered in a thin white sauce." Arrange a layer of eggplant in a greased 9x13 inch baking dish. Cover eggplant with all of the meat mixture, and then sprinkle 1/2 cup of Parmesan cheese over the meat. Cover with remaining eggplant, and sprinkle another 1/2 cup of cheese on top. Pour the bechamel sauce over the top, and sprinkle with the nutmeg. Sprinkle with the remaining cheese.